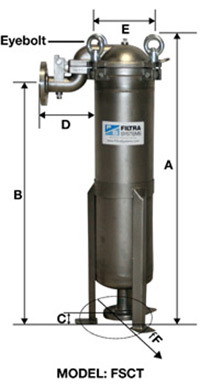 FSCT Single Bag Filter Housings are used in low flow applications, where high temperatures and pressures are required. These housings have a durable stainless steel construction and have a goose-neck inlet for laminar flow. All FSCT bag filter housings fit size #2 filter bags and we have them in stock for you now. 01-02-02 (First 01 is the # of bags (1), second 02 is the inlet flange size (2″), and third 02 is the outlet size (2″). All carbon steel vessesl are painted with two components epoxy primer & top coat. Vessel gasket selection is V (viton) or N (nitrile). Vessel includes perforated SS bag support basket. Basket available with F (Flat) bottom for pleated bags or R (Round) bottom for standard bags. FSCS style vessels accept industry standard #2 (30″) Bags. Add “- ASME” to end of model #, to order ASME option.